This is the twenty-second in a series of posts that report on the state of the parties as measured by opinion polls. By pooling together all the available polling evidence we can reduce the impact of the random variation each individual survey inevitably produces. Most of the short term advances and setbacks in party polling fortunes are nothing more than random noise; the underlying trends – in which we are interested and which best assess the parties’ standings – are relatively stable and little influenced by day-to-day events. If there can ever be a definitive assessment of the parties’ standings, this is it. Further details of the method we use to build our estimates of public opinion can be found here. 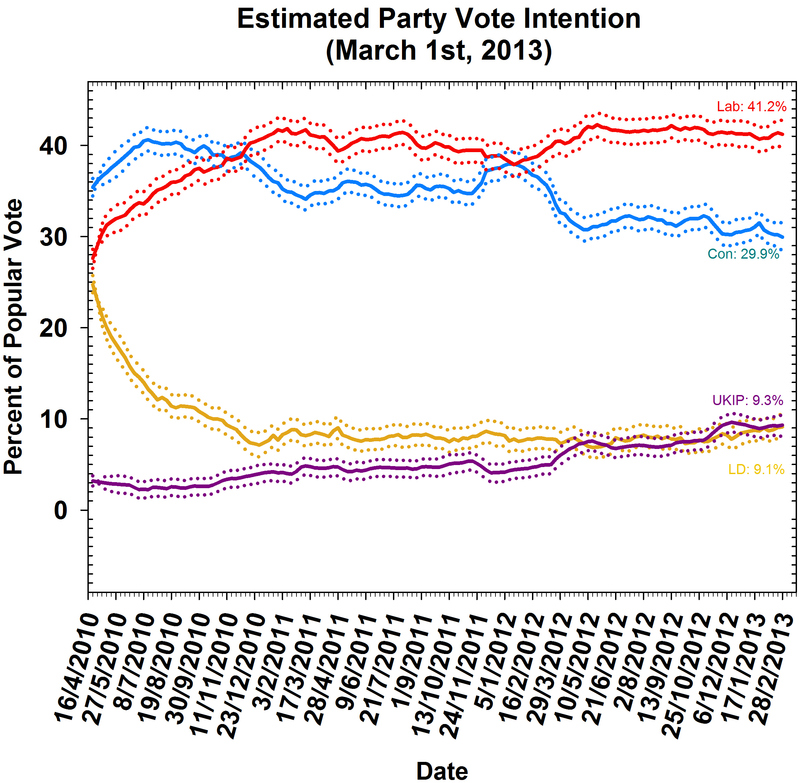 As the dust settles from the Eastleigh by-election, our latest polling estimates provide confirmation of the continued troubles of David Cameron and the Conservative Party, the continued rise of UKIP as a political force, and a slight revival in the electoral fortunes of the Liberal Democrats. As the months tick away, and this spring’s budget providing another ‘final chance’ for the government to deliver a game-changer, is it time to ask: is the 2015 election already lost? Following the downgrade of the UK’s triple-A credit rating and a humiliating third place in Eastleigh, with an ill-disciplined and unhappy backbench (and the quiet murmur of leadership rumours), and with the government facing potentially more bad economic news on the horizon, it is no surprise that since the last Polling Observatory report on February 1st, Conservative support has fallen from 31.9% to 29.9%. This is one of the largest single month shifts we have recorded since the 2010 election. In contrast, Labour has further strengthened its position despite an underwhelming performance in Eastleigh (where party expectations were much lower), with an increase in support from 40.7% to 41.2%. This leaves Labour with a lead of 11.3% in the polls, continuing a run of double-digit leads which has persisted for almost twelve months and must start to cast doubt on popular wisdom that this is ‘soft’ support that will crumble as soon as an election is called. Indeed, there is evidence that Labour’s reputation is recovering from when it was thrown out of office in 2010. Specifically, it has been steadily been polling around level with the Conservatives as the party best able to handle the economy in general, and has, in fact, been leading on taxation in most months since George Osborne’s calamitous omnishambles budget statement of March 2012 (see the YouGov issue tracker here). How is this even possible after the financial ‘mess’ that the last Labour government is so frequently accused of leaving the public finances in, and Labour’s struggle to develop a convincing economic narrative against the Coalition’s shock doctrine of austerity? Much of the reason is the simple fact that the debt crisis was the result of a global financial crisis only of limited making of the British government (with British voters typically being more pragmatic and nuanced than either their politicians or the media). Research by Ray Duch and Randy Stevenson has found that voters tend to punish governments less for poor economic performance in contexts that are more exposed to economic shocks from outside: in other words, voters can find it difficult to evaluate the competency of policy-makers in open globalised economies where external factors can influence macroeconomic outcomes. However, as economic waters have calmed across the Eurozone area it has become increasingly difficult for George Osborne and David Cameron to blame the excesses of southern European governments for the economic difficulties being endured at home. The label of ‘a recession made in Downing Street’ may be the most damaging for the Conservatives come the 2015 election, if the British economy does not pick up but things are improving on the continent. Despite what has been a tumultuous month for the Liberal Democrats, a steady performance in Eastleigh, based on a strong ground campaign and popular local candidate, combined with a rise in support from 6.9% to 9.1% suggests their electoral fortunes for 2015 may not be quite as bleak as some have predicted. Last, but not least, our estimates provide yet more evidence of the continued rise of UKIP, with its support increasing from 8.5% to 9.3%. Combined with the by-election result in Eastleigh pushing the Conservatives into third place, this points to the continued challenge to Cameron’s party: UKIP tends to attract older voters who perceive social and demographic change as threatening to their sense of British identity, voters who remain strongly concerned about immigration and have become deeply disaffected from the mainstream political elite. The rise of UKIP, and the roots of its support, needs to be put in the context of several decades of public policy. In recent times, governments have tended to favour the quickest path to economic growth above all other considerations, in particular focused on financial services and London. This economic imperative arguably was one of the factors behind Labour’s relaxing of migration policy after 1997, and its decision to allow unrestricted access to migrants from Eastern Europe in 2004. As a consequence, there has been a widening gap between the social and economic experiences of Britain’s cities – where economic growth has harnessed immigration and ethnic diversity is a well established and accepted part of social life – and experiences in suburban and rural “shire Britain”, which remain ethnically homogeneous and attached to a nostalgic 1950s ideal – a world of leafy suburbs, small businesses, country pubs, village greens, strict classrooms, obsequious deference to authority, and the friendly local policeman. Nigel Farage is a man of this world, and has proved effective at harnessing anxieties about contemporary developments – immigration, diversity and Brussels – and marrying them to a sepia-toned vision of the “common sense” society of times past. Anxiety and nostalgia combined is a potent mix, particularly for older voters, who turn out in droves. We expect UKIP to continue to play a high profile, disruptive role on the political scene over the rest of this Parliament – particularly at the European Parliament elections next year.